The benefits of pop-ups are manifold. Firstly, it provides a change of taste for the clientele of the host restaurant. Also, an awareness is created about the guest restaurant (which is usually from another city) so that on future visits to that city, customers know of a good dining option. Varq, the Indian fine dining restaurant at Taj Mahal Hotel, Delhi is known for its contemporary Indian cuisine. Here new techniques and new styles of presentation of Indian dishes have been adopted without disturbing the authenticity of the ingredients which go into the dishes. The restaurant is extremely popular in Delhi, and is regarded a pioneer in the field of modern Indian cuisine. 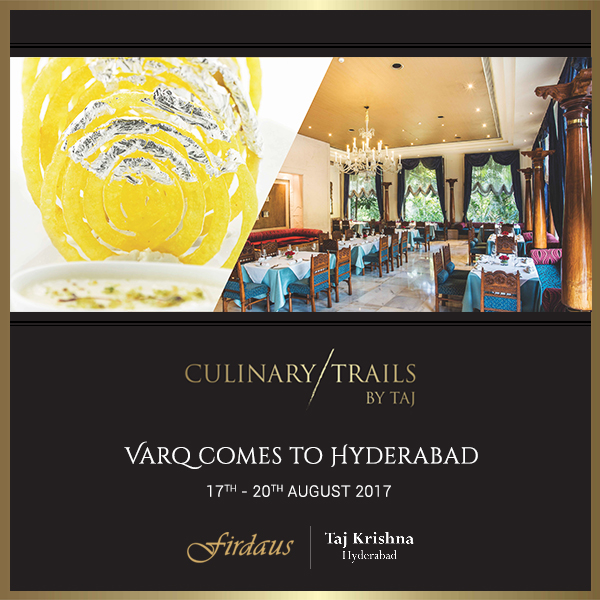 From 17th to 20th August, Firdaus at Taj Krishna is showcasing Varq under the “Culinary Trails by Taj” banner. 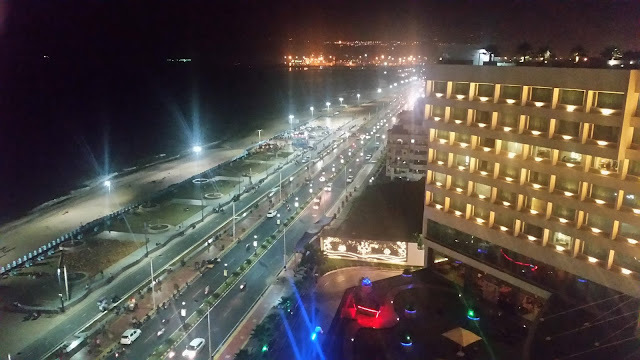 A team from Varq, including Sous Chef Rajesh Kumar Singh and F&B Manager Mohit Madaan, are in Hyderabad to oversee this. For these four days, Firdaus will offer quite a range of select items from the Varq menu – about 30 of their overall 60 plus dishes. Set menus for vegetarians as well as non-vegetarians will also be offered so that the customers can get an overall view of contemporary Indian food. 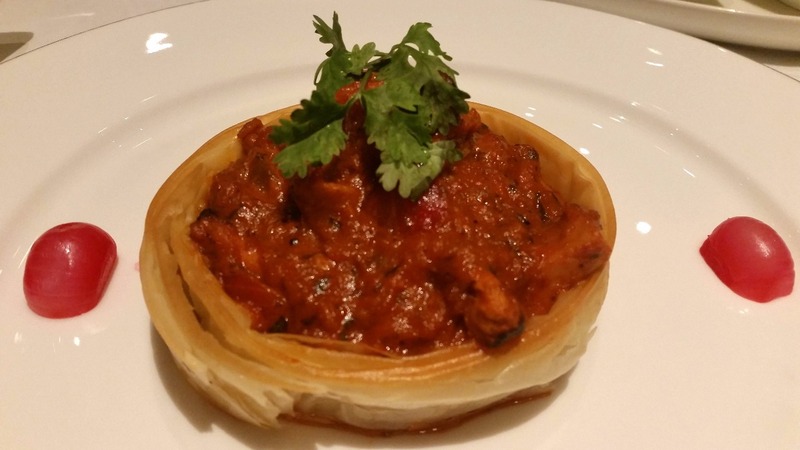 This is the second pop-up from Varq after a successful one at Taj Westend, Bangalore. Invited for a preview of the pop-up, we were treated to Chef’s Special Menu. First, we were greeted with Teekha Tamarind, a welcome drink. The taste of the mocktail had a combination of tanginess and sweetness, and I found it quite refreshing. 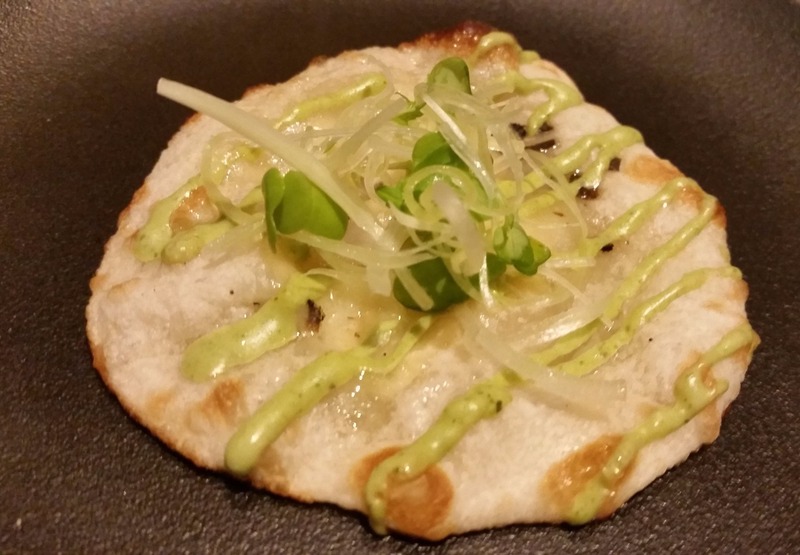 A mini Truffle and Cheese Naan was served as amuse-bouche. The naan was brushed with truffle and melted cheese and tasted extremely delicious. 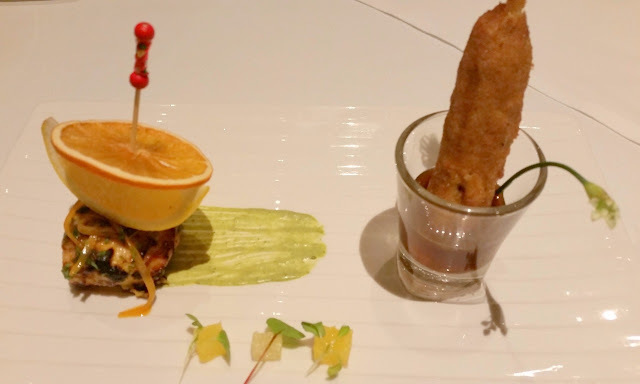 The starters were presented in a platter. There were two different non-vegetarian starters, Gandheri Kabab and Ambedi Fish Tikka. Gandheri is sugarcane in Hindi, and the presentation had minced chicken served on a sugar cane stick, which in turn was mounted in a shot glass with some amchur based chutney. Soft chicken, sweet sugarcane and the tangy amchur combined to deliver a really nice taste to the dish. Ambedi Fish Tikka also had a component of raw mango in it, with the delicate fish in a curd based marinade and garnished with sorrel leaves. 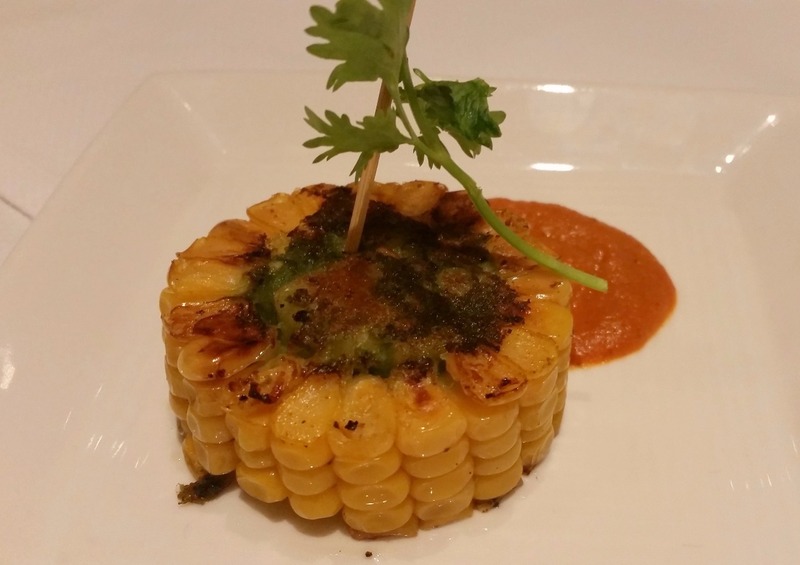 Corn Kabab was served for the vegetarians. 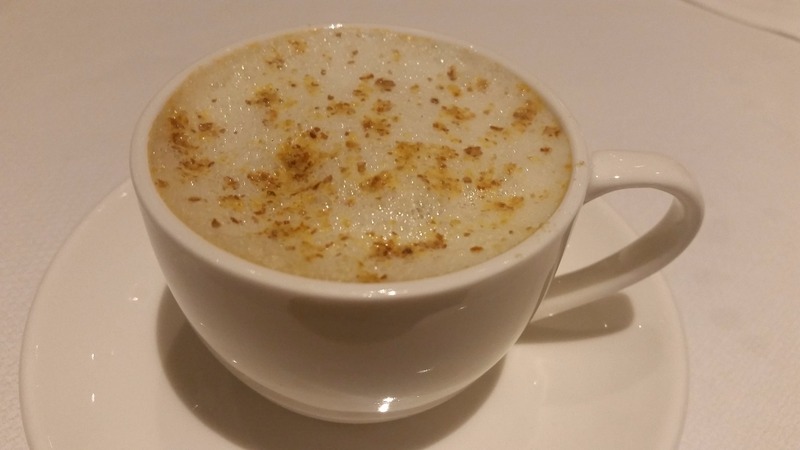 Kale Chane Ki Cappuccino is a signature dish of Varq. The black chickpea broth looked just like cappuccino, the frothy drink with chickpea dust on top of the froth. This is a must try dish in this promotion. Before the main course, Raw Mango Sorbet was served as a palate cleanser. The presentation of this deserves a mention, done brilliantly in a black bowl with liquid nitrogen streaming out. The sorbet was perfect with strong mango flavours and an aftertaste of kala namak. For the main course, one could choose one out of four dishes, but we ended up trying about three. 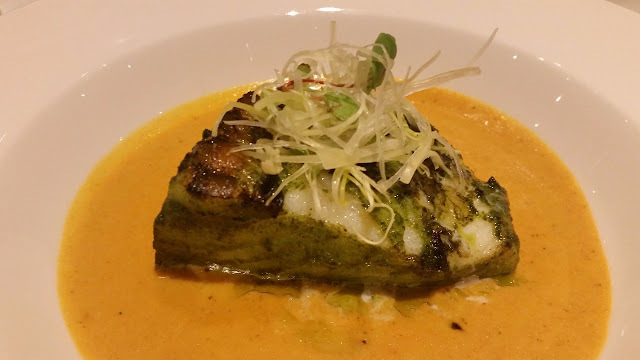 My choice was Green Chilli Tulsi Pine Nut Fish, a large chunk of pan seared sea bass with a green masala served on Alleppy style coconut curry. I had it with the Chilly Mustard Rice served as an accompaniment. Martabaan Ki Meat is a lamb dish which is slow cooked in a traditional ceramic martabaan which is commonly used for preparing pickles. 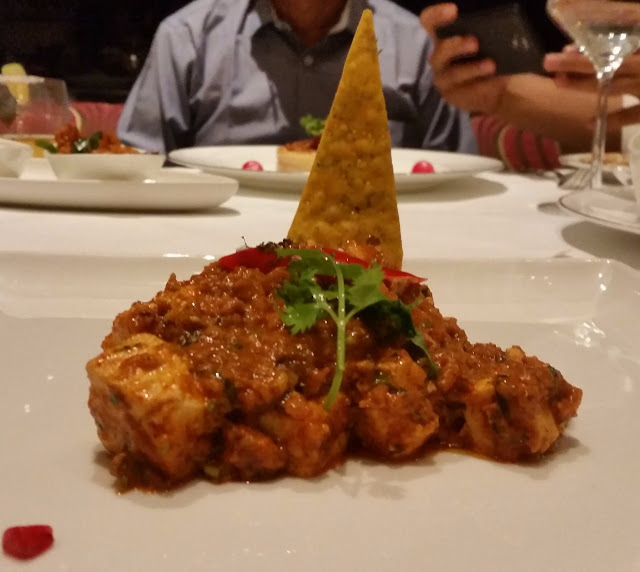 This dish cooked with pickled chillies complemented well with the Jalapeno Naan. I took quite a fancy to the Aloo Lal Mirch which was served as an accompaniment too. I tried a little bit of two other dishes – Murg Sirka Pyaz and a paneer dish the name of which I do not remember. The former was a onion and tomato gravy with soft chicken tikkas. This was served in a round crust and again styled well. 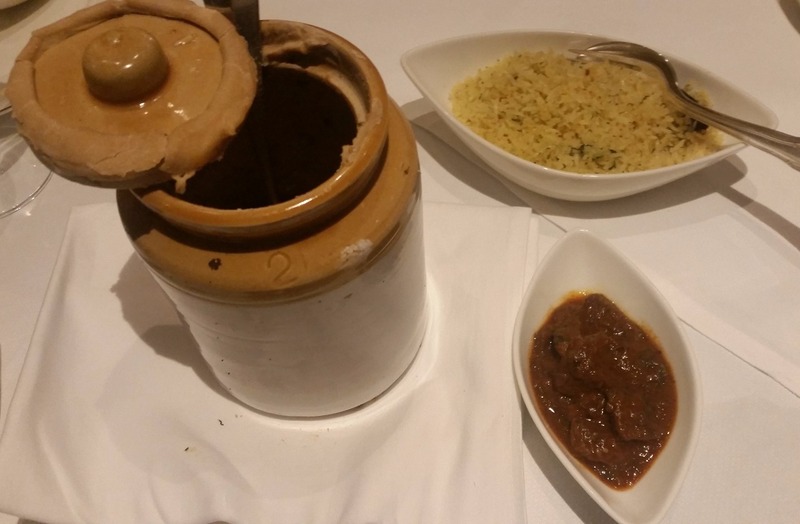 Both the dishes gives you a feel of typically good North Indian cuisine. This was definitely one of the promotions where all the dishes were consistently good. For desserts, again we had a nicely styled platter. 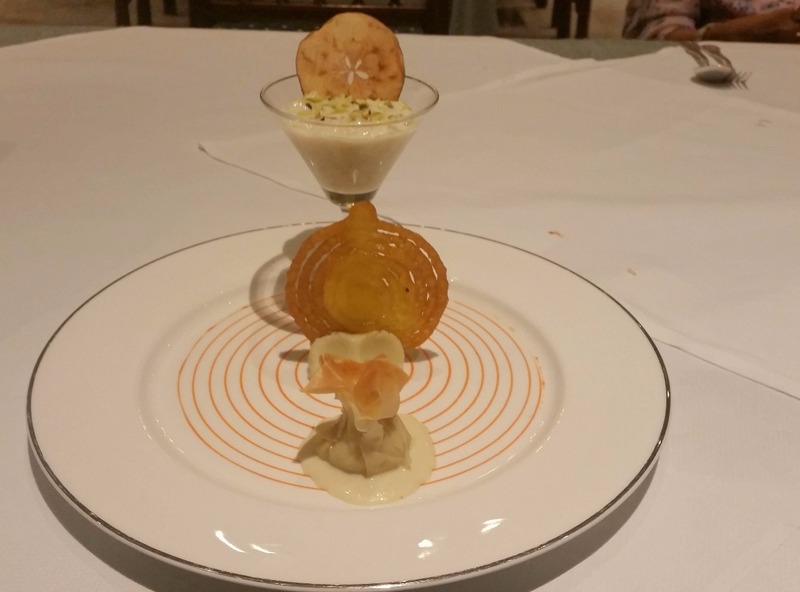 It had Apple Kheer, Jalebi, and Kalakand. The thick apple kheer was made with green apples. The soft kalakand and blueberry fillings inside filo pastry sheets served in the shape of tokri were exceptional. 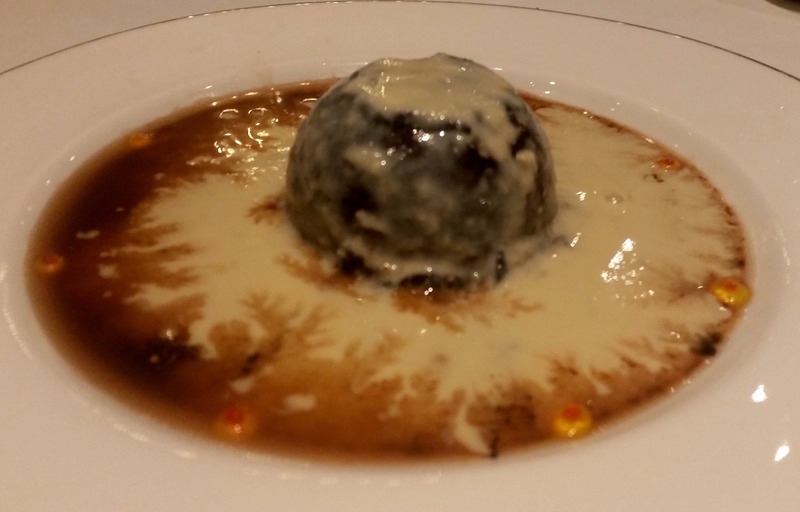 Finally a Chocolate Dome was brought to the table which was flambéed right in front of us. The chocolate dome had chikki kulfi in it. Then rabri based on Baileys cream was poured over the melted dome, resulting in a dessert with a synergy of different tastes. 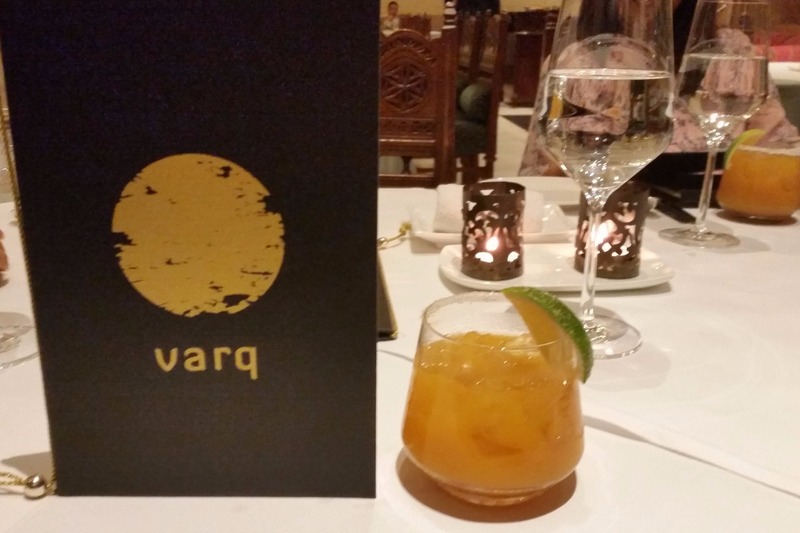 Varq is also known for its signature teas. 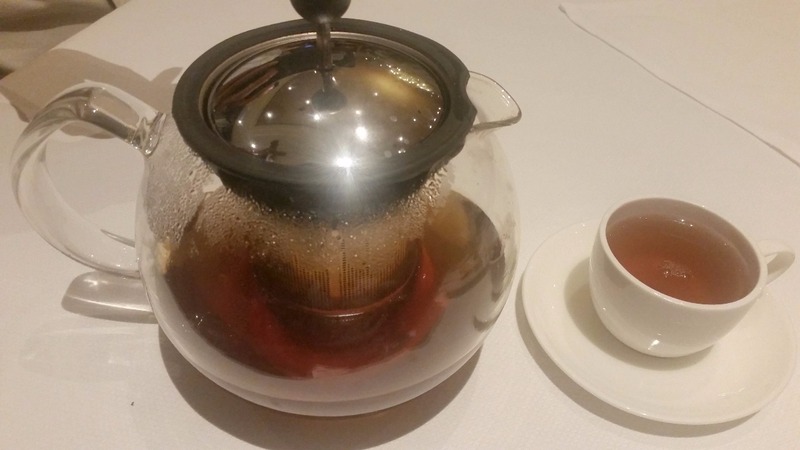 And we ended our meal with some refreshing rose tea. I would rate this promotion at Taj Krishna as one of the best of the fifty odd food festivals I have attended in Hyderabad during 2017. It should not be missed by any gourmet diner who loves Indian food. As you progress with the meal, the Varq team is always on hand to explain the finer nuances of the dishes. Apart from a-la-carte dishes, there are two set menus from the chef which may be tried out if you want a complete experience. The festival is on for both lunch and dinner till Sunday.